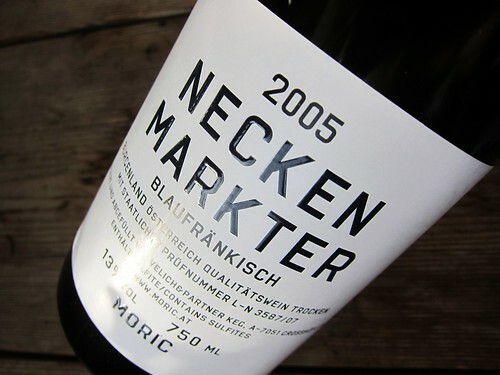 Today’s bottle is a 2005 Neckenmarkter, thus different from the one I had since it isn’t stemming from old (Alte Reben) but from younger vines. I snapped it from some kind of wineshop sale event, not knowing if it might be already over-aged or from a weak vintage… Well, I have to admit: I just jumped on a price that seemed low to me. One interesting fact about this wine certainly concerns the varietal. Blaufränkisch, which is also known as Lemberger (in Germany) was long time seen as a low-quality local grape yielding simple red wines until a few winemakers got a bit more ambitious about it. Moric is one of these estates. And with all that hype about Moric, I’m now quite curious of how this rather “matured” wine of theirs is showing. Color is an opaque ruby-red to dark cherry-red. The nose is a bit confusing. I smell red berries and bread but as well some kind of weird gypsum note, reminding me of some of the dead Syrahs from Northern Rhône I had in a recent tasting. Well… The wine is breathing fresh air for the first time in 8 years, so maybe it needs a short acclimatization phase. On the palate it appears rather enticing in terms of texture and weight but at the same time it shows a harsh acidity spike on the mid-palate that leaves me a bit puzzled. Hence I decided to abandon this bottle for a day or two. Now the nose is much more charming. It boasts notes of fresh cut dark German bread, cherries and twigs of herbs (rather the green aspect of the twig than the herb). There’s a certain sense of cooked fruit in the nose as well, suggesting a rather expanded state of ripeness. Palately speaking, this is just superbly balanced now both in terms of weight and texture. Like a sheet of silk covering your palate and at the same time with a serious enough weight, but also far away from an exagerrated boldness. Graceful. There is a definite fruit sweetness on the palate, with punctuations of balsamic notes and fruit acidity. A certain menthol coolness appears here and there. On the back palate, an anise-like sweetness creates the breaking point of the wave into the finish. A counter-attack of the acidity creates a feel of fresh juiciness in the finish. A good effort here from this up-and-coming Austrian estate. It is definitely time to drink this wine, and it shows quite charming if you give it time to breath a little bit. A decanter or a Vinturi definitely wouldnt be wrong here. I chose to leave the wine in the bottle for 2 days which worked as well. If I was Robert Parker or James Suckling, or some other important dude, I’d gave this wine a clean 90 points (or some rating aroung 90 points). As an adept of Vimpressionism, I’d see this wines somewhere between + and ++. Wow, interesting. I would never think to wait on a wine that seems tired. Guess there are some zombies out there! Some wines deserve a second chance! :P Ok, got it with the + and ++ now. Great to learn from the grand Guru of Vimpressionism! ;) So then this one’s a + !